Abbey Culture – This strain was initially collected from unpasteurized honey from my neighbor’s hives here in Washougal, WA. This strain is amazing, producing fruity bubblegum flavors it tastes just like a Belgian abbey yeast, it also has a fairly high tolerance, producing a beer with nearly 12% ABV. It’s also pretty highly attenuative. Subsequent local yeast harvests indicate that this yeast is the dominant wild strain in my neighborhood. Palatki Culture – This was captured from juniper berries and leaves harvested at the Palatki site in Sedona near ancient Native American cliff dwellings and rock art. The strain is very highly attenuative and seems to slightly accentuate hop bitterness in the finished beer. Early on in the ferment it produces fruity esters that eventually give way to spicy saison-like phenols if left to ferment for a few months. Likely this is due to some sort of brett-like yeast in the mix. Omani Culture – This strain was collected from a date originating in Oman. It produces the clove flavors commonly associated with hefeweizen style beers it produces some banana but in lesser amounts. It is highly attenuative and also most definitely has a strain of something brett-like in with it as it will continue to ferment a beer for many months and produce a nice rustic flavor. Milwaukee Culture – This is the first strain that I harvested from red wine grapes I grew in Milwaukee WI. It produces distinct tiny bubbles and dense foamy krausen. The flavor is fairly neutral and it has medium attenuation. Ginger Bug – This culture was harvested from some grated ginger that came from the grocery store. It appears to contain sacc, brett and lacto. I typically use this to ferment ginger bug beers with only simple/table sugar, but it can also attenuate (and sour) malt based beverages quite well. Wasp Culture – This culture was harvested from a hibernating queen wasp I happened to find one winter day. The saccaromyces activity of the culture seems to be the same or similar to my Abbey culture but then a funky brett-like secondary fermenter shows up to contribute some farmhousey phenols. This culture has also produced a large amount of ethyl acetate so be cautious with oxygen exposure. 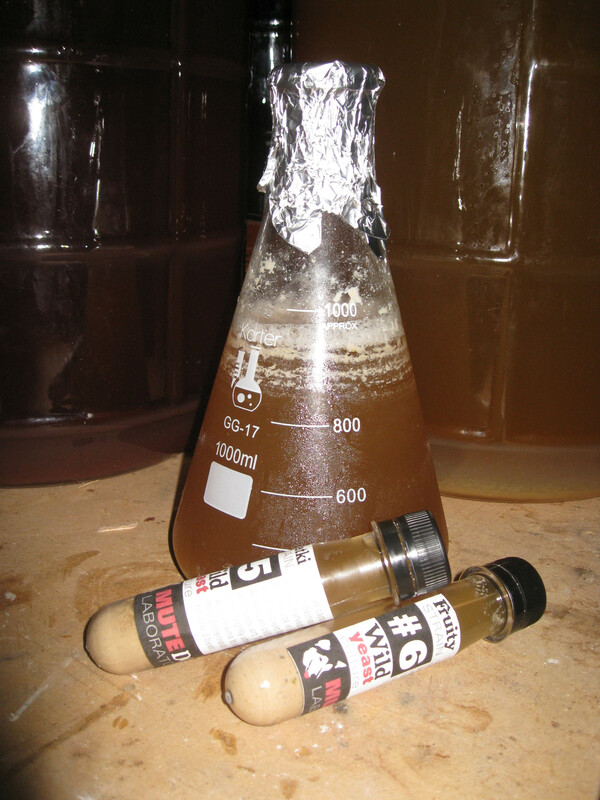 Kraut Culture – I got this when trying to build up lacto from the dregs of spontaneously fermented sauerkraut, after the second step the yeast reared it’s head and so it’s now a mixed culture. It’s pretty fruity to neutral with no major off flavors, but more experimenting will need to be done. Sauvie Island Banana Plantation – This culture came from u-pick raspberries I harvested on Sauvie Island near Portland, OR. It produces massive amounts of isoamyl acetate (banana), with a bit of clove as well. After 3-4 months all of the banana is consumed and replaced with spicy phenol from some secondary activity. John Nagar’s Revenge – This culture came from leaf litter I collected from the forest floor near the former location of a brewery that existed in the 1880s (run by John Nagar). The profile is fairly neutral, mild esters and slightly phenolic. It’s also shown the ability to ferment at fairly cool temps (mid-upper 50s) albeit rather slowly (which may also depend on pitch rate). I’ve been known to send out samples of these yeasts to people if I’m asked nicely.